The gardeners who attend the swap are the best way to distribute and successfully grow these seeds far and wide. Date: October 24th, time TBD (early). Many people just hang out the whole time talking about plants, helping others id mystery plants, and generally enjoying their coffee, free doughnut holes, and all things gardening. Master Gardeners and NWF Habitat Stewards will also be there to assist with plant identification. Our mission is to make all yards in our neighborhoods more beautiful and easier to maintain, while consuming less water…for free! Now more than ever, we need to reproduce the plants that do well in our hot Texas summers. Bring the plants that did well this summer so our yards will have less of the “California Golden” color next summer. Do you have zero plants? Come anyway, we’ll send you home with some. completing the Wildlife Austin requirements and certifying the second most new habitats in 2014. Thanks to you, the City has been re-certified as a Community Wildlife Habitat! 301 W 2nd St, Austin, TX 78701. Jane Tillman will be giving a free talk next Tuesday, Sept. 9 on Hummingbirds of Central Texas, at Yarborough Library from 6:30 to 7:30 p.m., 2200 Hancock Drive, Austin, TX 78756, USA in central Austin. Meredith Gray, Conservation Program Coordinator, Sustainable Urban Agriculture & Community Gardens & Wildlife Austin Program in Austin, TX, has announced the new 2014 Wildlife Austin Neighborhood Habitat Challenge and it is The Pollinator Garden Challenge! Neighborhoods are once again challenged to create wildlife friendly yards using native plants, but with an added challenge of supporting our pollinators with specific plant palettes and garden husbandry. This spring, make a home for bees, butterflies, beetles, moths, hummingbirds in your backyard. The Habitat Challenge is an annual competition hosted by the City of Austin Parks and Recreation Department’s Wildlife Austin program. To compete in the challenge, participants create backyard habitats in their neighborhoods based on criteria developed by the National Wildlife Federation, which include providing food sources, water sources, cover, and places to raise young for local wildlife. In 2014, neighborhoods are once again challenged to create wildlife friendly yards using native plants, but with an added challenge of supporting our pollinators with specific plant palettes and garden husbandry. This spring, make a home for bees, butterflies, beetles, moths, hummingbirds in your backyard. The top three neighborhoods that complete all the requirements and certify the most new habitats between April 15th and November 15th, 2014 will be recognized by the City of Austin and eligible for prizes. This challenge extends to people with NWF-certified gardens and those who are just starting to add natives to their ecosystem (remember it can be an arrangement of pots on your balcony, not necessarily a large garden.) Following are the steps to follow. We ask that if you are not already certified with the NWF for backyard habitat, that you fill out both applications – the Pollinator Garden Requirements and the NWF application. Wildlife Austin has a certain number of prepaid NWF applications that are given out first come, first serve. Please email us at wildlife@austintexas.gov with your mailing address if you are interested. We can help you submit your NWF application to certify your backyard habitat. Please submit the Pollinator Garden Challenge Requirements (attached here) to wildlife@austintexas.gov. Please note that when you complete the minimum requirements for the Pollinator Garden Challenge, you also complete the NWF habitat requirements. By participating in the Pollinator Garden Challenge, you can pick up the NWF certification along the way! Congrats on deciding to further improve your backyard habitat! Please fill out the Pollinator Garden Challenge Requirements (attached here) and submit to wildlife@austintexas.gov. To win the Challenge, the neighborhood will participate in a community habitat project such as removing invasive plants, planting trees, restoring a creek area, or planting a neighborhood butterfly garden. Additionally, participating neighborhoods will publish an article about the habitat challenge published in neighborhood newsletter and/or website. By the way, I’m game to lead a community habitat project. Please let me know if you are interested in a project. I can also easily write an article about the challenge. 2014 Grow Green Homeowner’s Landscape Training ($10) – This Wednesday! Celebrate Earth Day by joining the City of Austin Grow Green team for our spring homeowner’s landscape training. WaterWise Landscape refers to landscaping and gardening in ways that reduce or eliminate the need for supplemental water from irrigation. 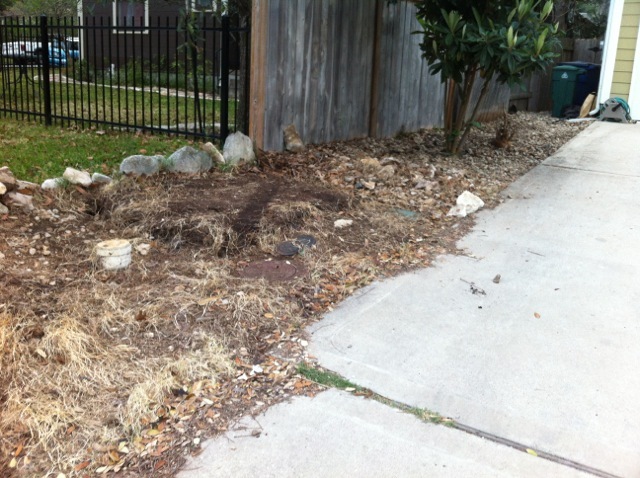 Major water savings can be made by converting your healthy turf grass to native plant beds and permeable hardscape. Residential properties may receive $25 for every 100 sq. ft. converted. Get details on program eligibility, the process and requirements, as well as information on some new landscape-related rebates. There’s no doubt we live in an urban area. Lots ‘o concrete – which is so hot in the summer! I love the cooling effect plants have on the ecosystem and the human body (and wildlife bodies). Our house had lots of rock landscaping and grass when we bought it in 2009. A few years ago, we unfortunately had to remove 5 agaves from the hell zone strip near the street. In doing that, I added wildflower seed that love the harsh climate in that area. The wildflowers bloom from February – July and then dry out. I usually cut them back in September, and they soon start growing again and present as small green plants for most of the winter. In any case, let’s move on to my last “rock zone” that I replaced in the last year. 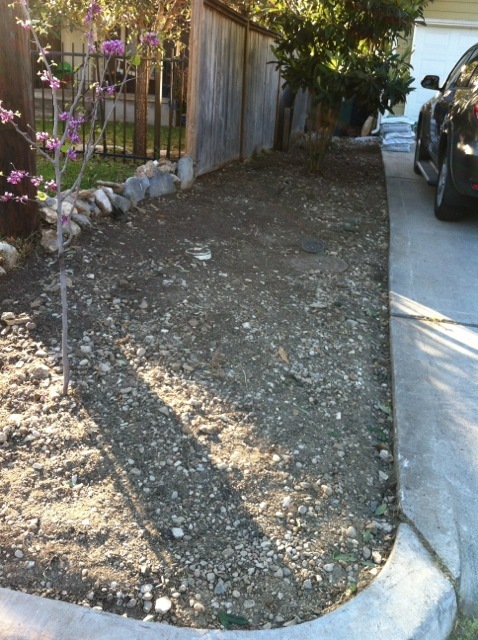 This rock zone had an agave on it near the street (which we removed) and added, in replacement, a Texas Red Bud. We added a vegetable garden, but I found that I was not a great vege gardener or that the creatures got everything first. As the years went by, the area became a bermuda grass rock haven that we had to weed whack since there were so many rocks. I decided to kill the grass with my solarization method (I used black plastic) between December 2012 – March 2013. When we removed the plastic, we had dead bermuda grass and still a lot of rock. Grass removed by hand, ready for seed. There was still a bit of rock in the soil, but that’s certainly OK for native plants and grasses. I bought a Pocket Prairie seed mix from Native American Seed for this area. This has so many different types of seeds, you’ll have great plants in your garden year-round. I spread these seeds in March 2013 which is not optimal. It would have been better to do it in the Fall but alas, that is not when I was ready. So I did it anyway. And it worked just fine! When you spread the seeds, I just threw the seeds around on the ground, then hoed very, very lightly so about 1/4″ of dirt gets moved on top of seeds. Then I watered it for about 15 days until I saw sprouts. Then I just left it. I’m not sure I even watered it. First, the grasses grew, so I had nice grasses this past fall. Now, the flowers are growing. The best part: I haven’t seen any bermuda grass (I hate to even write that down but it’s true for the moment, anyway). I had a few weeds this spring but dug them out easily. In addition to the Texas Red Bud, there’s a Mexican Plum (provided by the City of Austin) and a non-native Loquat tree that was here when we bought the house. View the slideshow the current show that’s happening. Here’s a great opportunity to learn how to build a rain garden. It’s a great system to collect run-off rain and slowly drain into the ground while being absorbed by native plants and grasses that like “wet feet” (i.e., they don’t mind be in sloggy water for a day or two at a time.) If you can’t make the workshop, be sure to click on the links for the Austin Grow Green website that has more information available there for free! Learn how to build a rain garden at your home, school, or community garden! A rain garden is a low area that absorbs and filters rain water runoff that comes from roofs, sidewalks, and driveways. Rain runs off the hard surfaces, collects in the shallow depression, and slowly soaks into the soil. Rain gardens are planted with colorful native plants and grasses, and, where the water collected is free of contaminated run-off, food-producing plants can be used, as well! Join the City of Austin’s Watershed Protection Department and the Sustainable Food Center for an interactive, outdoor, hands-on introduction to rain gardens at the J.P.’s Peace, Love and Happiness Foundation Teaching Garden at Sustainable Food Center.